RNA interference (RNAi) is the technique employing double-stranded RNA to target the destruction of homologous messenger RNAs. It has gained wide usage in genetics. While having the potential for many practical applications, it is a reflection of a much broader spectrum of small RNA-mediated processes in the cell. The RNAi machinery was originally perceived as a defense mechanism against viruses and transposons. While this is certainly true, small RNAs have now been implicated in many other aspects of cell biology. 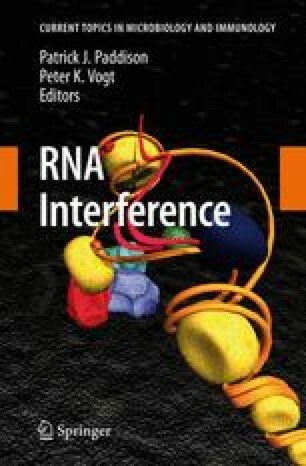 Here we review the current knowledge of the biochemistry of RNAi in Drosophila and the involvement of small RNAs in RNAi, transposon silencing, virus defense, transgene silencing, pairing-sensitive silencing, telomere function, chromatin insulator activity, nucleolar stability, and heterochromatin formation. The discovery of the role of RNA molecules in the degradation of mRNA transcripts leading to decreased gene expression resulted in a paradigm shift in the field of molecular biology. Transgene silencing was first discovered in plant cells (Matzke et al. 1989; van der Krol et al. 1990; Napoli et al. 1990) and can occur on both the transcriptional and posttranscriptional levels, but both involve short RNA moieties in their mechanism. RNA interference (RNAi) is a type of gene silencing mechanism in which a double-stranded RNA (dsRNA) molecule directs the specific degradation of the corresponding mRNA (target RNA). The technique of RNAi was first discovered in Caenorhabditis elegans in 1994 (Guo and Kemphues 1994). Later the active component was found to be a dsRNA (Fire et al. 1998). In subsequent years, it has been found to occur in diverse eukaryotes such as Drosophila, Schizosaccharomyces pombe, Dictyostelium, Neurospora, plants, mice, humans, and many other organisms (Baulcombe 2004; Hall et al. 2003; Kennerdell and Carthew 2000; Paddison et al. 2002). It is possible that RNAi is a reflection of a much broader spectrum of small RNA functions in the cell as described below. It is believed that RNAi evolved as a means of protection against viruses and against aberrant transposition by transposable elements in the genome (Kalmykova et al. 2005; Sijen and Plasterk 2003). However recent discoveries of the involvement of small RNAs in many other processes might suggest that these defense mechanisms, while obviously important, might actually be derivative processes rather than evolutionarily basal in origin. The RNAi genes also play an important role in the maintenance of centromeric heterochromatin (Volpe et al. 2002; Pal-Bhadra et al. 2004b) and germline stem cell division (Kennerdell et al. 2002). As a technique, RNAi can also be used as a tool for gene silencing studies and for developing (potentially) therapeutic agents (Jacque et al. 2002). The trigger for all RNAi-related mechanisms known to date is a dsRNA molecule. This molecule can be introduced artificially or synthesized endogenously, for example, from heterochromatic repeats. The most potent source of artificial dsRNA is a sequence of about 500–700 bp cloned as inverted repeats, which is transcribed to give hairpin-loop dsRNA (Hannon and Conklin 2004). This dsRNA is then cleaved by specialized enzymes and assembled into a multiprotein complex. This results in specific cleavage of the target mRNA by virtue of complementarity between the small RNA (from the trigger) and the target mRNA. A series of genetic, biochemical, and structural studies have identified the different components of the RNAi machinery in Drosophila and also elucidated many mechanistic steps as described below (Fig. 1).